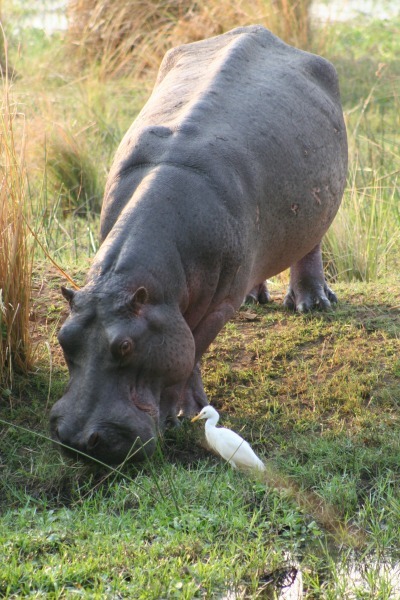 The Hippopotamus - is this really the most dangerous African animal? Hippopotamuses are the third largest land mammal species on our planet - after elephants and white rhinos. They are not very active during the day, but some will occasionally play and some bulls will take some time out for a good fight with a potential competitor. Let's have a look at some of their interesting habits. 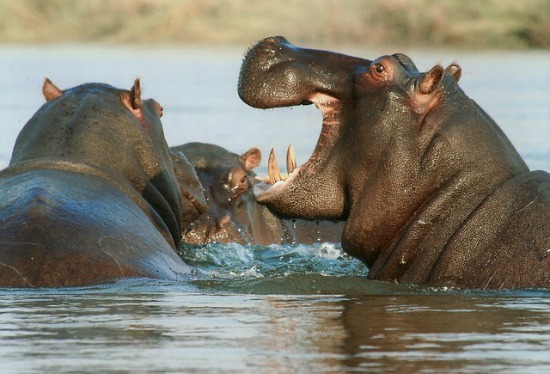 The hippopotamus has the reputation of being the most dangerous wild mammals in Africa. Based on human fatalities, this reputation is probably well deserved. One thing that must be remembered is that unlike most land animals that usually have many escape options, these animals have a relatively small area to escape to in their "water homes". If they get frightened on land they charge back to the safety of water and trample anything that comes in its way. 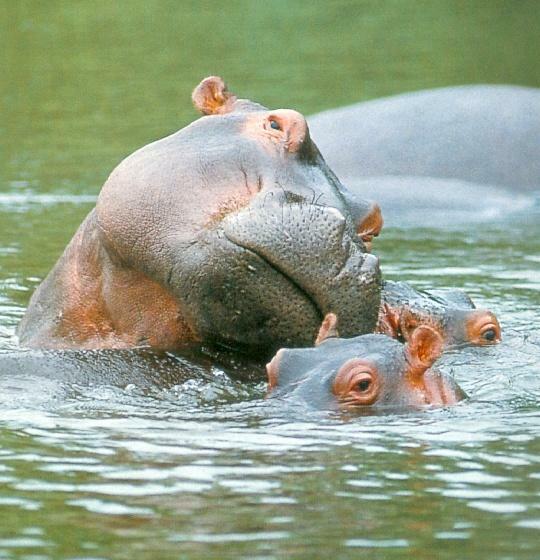 On land a hippopotamus can reach a top speed of 40 kilometers per hour and they are surprisingly agile. To get between this animal and water is to risk being trampled as it tries to get to safety. Yawning displays is a dominance signal and a clear signal for intruders - including you - to stay away. They have an unmistakable shape and size. 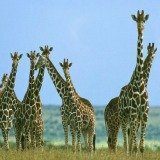 They are the third-largest living land mammal in Africa, after elephants and white rhinos. 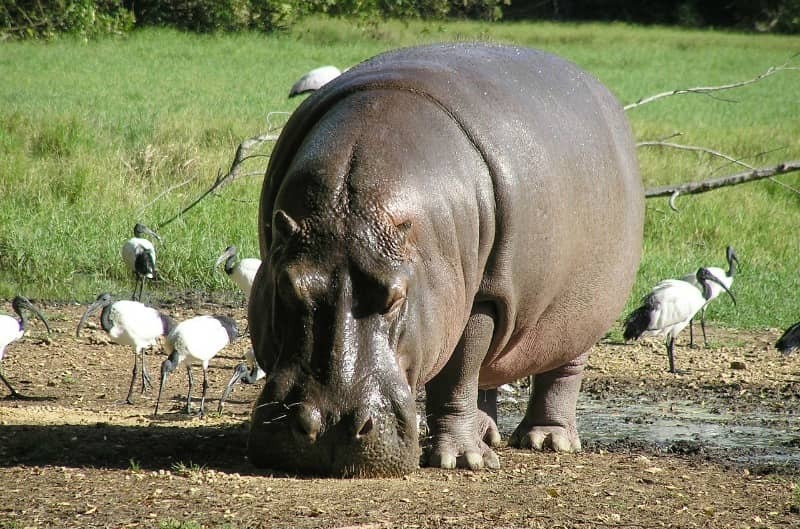 Hippo skin is dark grey and smooth, pink around the eyes and lips and in the skin folds. The head is large with a broad mouth in which the upper and lower canine teeth and incisors are enlarged into tusks. The eyes and ears are small and set far back on the head. The plump and bulky body is set on short, stumpy legs. The neck is short and thick and the skin here is heavy with folds. They suffer from sunburn, which cracks their skin. One of the strangest possible sights you will see on an African Safari is that an overheated hippo looks as if it is sweating blood. These are mucus glands in their skin that contains a red pigment. This mucus acts as a very effective sunscreen. If you do your African safari on overcast cool weather days in summer or warm, sunny weather days in winter you are very likely to see them sunning themselves on riverbanks. You are likely to see a them wallowing in mud holes only when there is no water available. If you go on a guided night drive safari you can spot them grazing on land. They signpost their pathways with dung piles. They prefer water where there are gently sloping banks. When viewing these African animals in water you will see only the tops of their heads and backs exposed. During most of the day they have to spend their days submerged in water, which must be at least 1,5 meters deep because on land they overheat and dehydrate rather quickly. These "river pigs" can submerge themselves under water for up to six minutes. 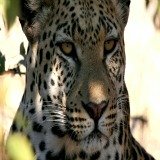 These African animals have few predators on land and can therefore afford to feed on their own. You are likely to find them in rivers and swamps. Their diet consist of lawns of short grass within 1 or 2 kilometers of water. Their modest appetites are attributed to their sedentary life, which does not require high outputs of energy. They will will eat grass down to a smooth lawn by plucking it with the hard edges of its wide lips. If the supplies near the water are exhausted they will cover up to 10 km in a night on the round trip between water and grazing. These wildlife animals can stay under water for up to six minutes and can either swim or walk along the bottom. When submerged the water supports most of its weight and they move with a slow-motion grace. Both ears and nostrils can be closed to stop water getting in. 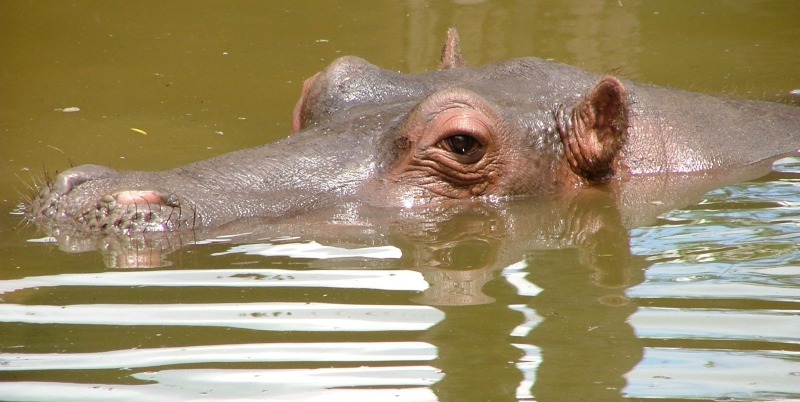 What Social behavior does Hippos exhibit? The basic unit of hippopotamus society is a group of up to 30, containing females with their baby hippos. They are lorded over by a single dominant bull that has gained his position by being successful in combat against other males. This gives the bull exclusive access to the females in his group. The groups are territorial, each occupying a stretch of river or lake. The herd bull is extremely aggressive to challengers. He marks his territory, by splattering dung onto rocks and bushes. At frequently marked spots dung can accumulate into heaps half a meter deep. By defecating in the water they inject important quantities of energy and organic matter into the aquatic food pyramid. 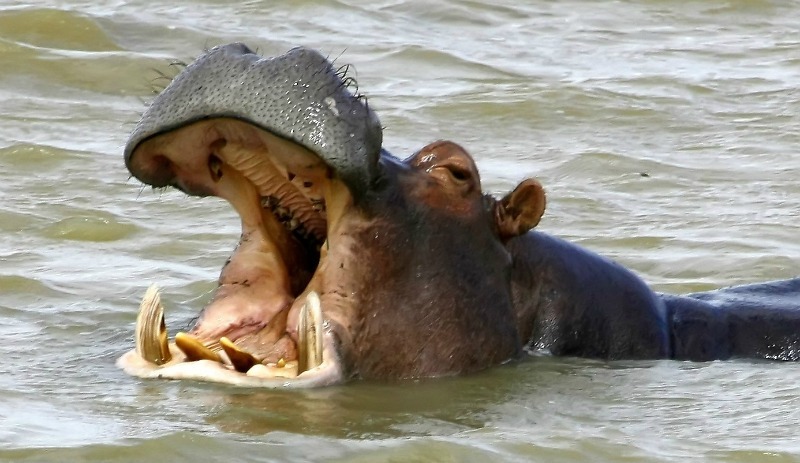 Why do male Hippopotamuses have those big teeth? Hippo fights over territory and females are savage. Disputes between adult males begin with a yawning display that shows off their formidable teeth. Yawning displays the tusks and is a dominance signal. This is a sign for intruders to stay away! The contestants then scoop water at one another. Unless one of them submits by lowering his head, a full-scale fight follows. During the fierce battle the sharp canine tusks are used to stab and slash the opponent's head and shoulders. 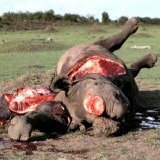 Despite their thick hides they suffer serious and sometimes fatal wounds in these battles. Hippo males are usually covered in scars from territorial battles. If the losers are not killed they are driven out of the pool and have little chance of survival. A bull may hold a territory for as long as 12 years. In the water their main natural enemies are crocodiles. 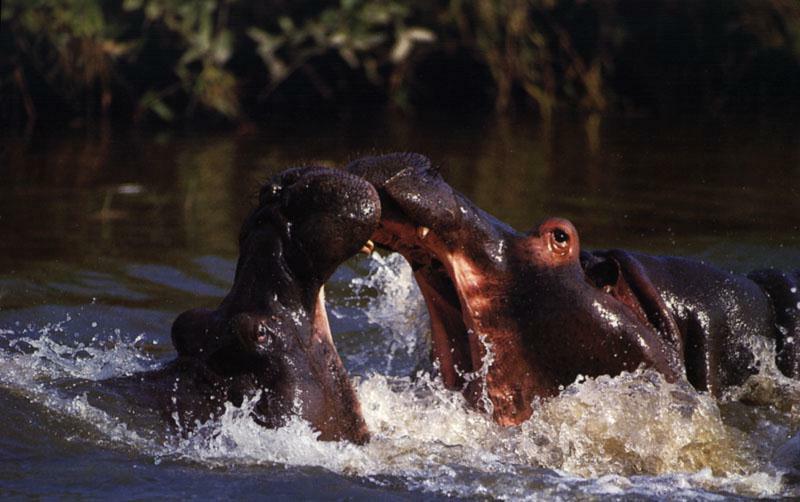 In a fight a crocodile stand no chance against an adult hippo. They also attack boats that get too close to them, especially if a female has a calf. As a rule only the dominant male of a herd mates with the females. He checks their reproductive condition by smelling their urine. 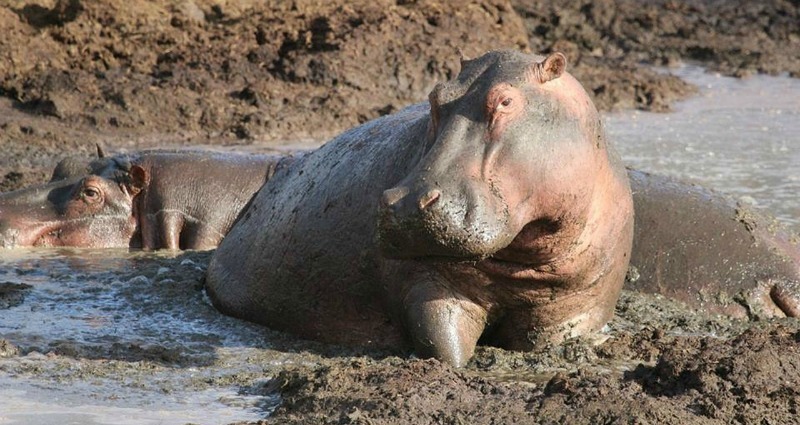 Mating takes place in the water with the female hippopotamus completely submerged. Conventional mounting takes place in the water. The buoyancy effect alleviates the bulk that would make mating on land very difficult. 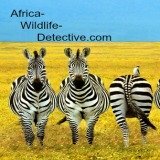 These are the only African land mammals that mate in the water. If you are lucky enough to spot calves on your African Safari you will see them indulging in play fights and pushing contests. The youngster stays in the water for the first few days, after which it goes with its mother when she feeds. A mother does not introduce her calf to the herd until it is 10 to 14 days old. The rest of the females act as baby sitters. In water that is too deep for it to stand, a calf uses its mother as a raft. In crowded populations dominant males kill youngsters and newborn babies. Calves begin grazing at five months of age and they are weaned at 12 months. The herd bull drives out adolescent males when they are seven to eight years old. Young females usually stay with the herd.